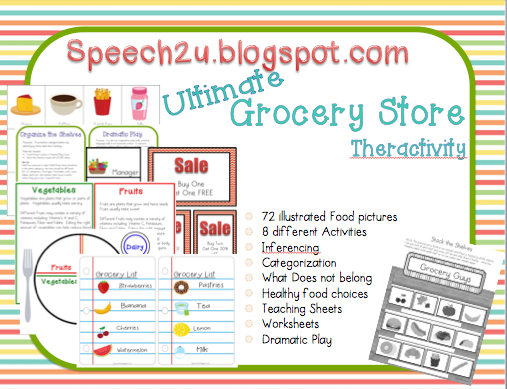 It’s DAY 18 of my Birthday Month Giveaways and I am raffling off a giveaway by Speech2U, which is a Grocery Theractivity. This is an awesome 48 page packet which contains 72 different food pictures and 9 different activities. It can be used with ages ranging from preschoolers through middle school and is great for goals targeting life skills. You can find this product in Speech2U TPT store by clicking HERE or you can enter my giveaway for a chance to win. Love this for the older kids in the functional skills class. They shop once a week so this would be great! I have lots of client’s right now, from 7-21, working on pragmatic language and functional life skills. This would be a great addition to my materials closet! Great activity! I have lots of students from preschool to high school functional life skills that would benefit from this. I would so use this with my FAA classroom!